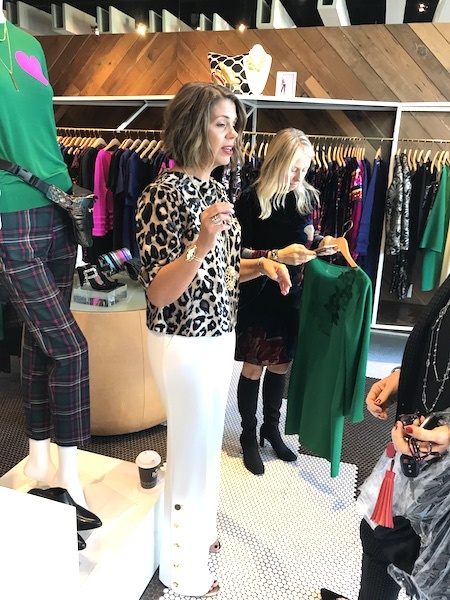 Yesterday, Kim from Northern California Style and Suzanne from Ask Suzanne Bell hosted a fun shopping event at the Trina Turk Boutique in Burlingame. Here the two of them are in action, helping a customer. 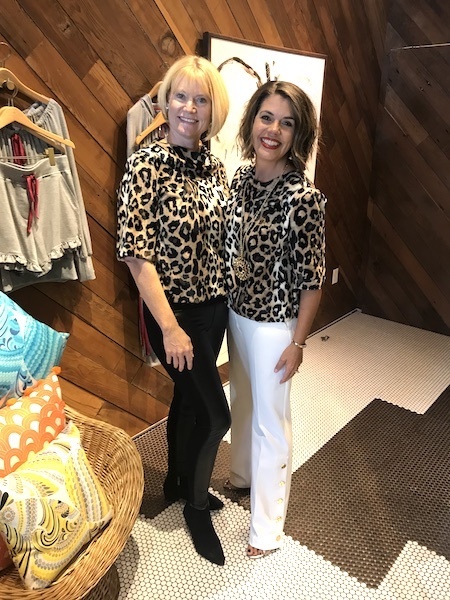 I LOVE, LOVE, LOVE Suzanne's white pants and leopard top - both from the current collection. Isn't it the perfect holiday statement outfit? I honestly loved everything in the store and had a blast trying on a wide variety of tops. The Trina Turk Sass Sweater Top had caught my eye online, and I loved it just as much on. The pink is such a happy color, and the fringe details are just so much fun. I could see myself wearing the top a lot - with black pants, white pants, jeans, different pencil skirts, etc. The top comes also in black and blue. Here is Susan, Suzanne's friend, in a beautiful blue dress, which I believe she ended up buying. The Trina Turk Astral Top had not been on my radar, but I loved it as soon as I put it on. It's so soft and comfortable. Yet, it's dressy and fun. Again, I love that it can be dressed up or down. 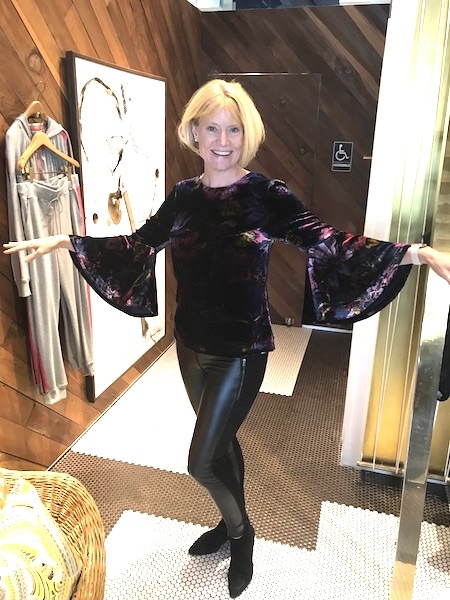 I had to try on the Trina Turk Club Soda Top as I loved it so much on Suzanne. And I loved wearing it. For one, it's so soft and comfortable. Again, I think it's a really versatile top that looks great with white pants, black pants, jeans, skirts, etc. Here is the top with black pants and white pants side by side. The current collection has beautiful greens - perfect for the holidays. I'm wearing the On the Rocks Top, and I love the cut and color. While I loved the top in green, in the end, I thought it would be more versatile in black, and that's what I bought. About three years ago, I bought a black Trina Turk Accomplice Top, and it's been by far the most worn item in my closet. I take it on every trip, and have worn it with literally every bottom in my closet. It's so easy to wear, comfortable, doesn't wrinkle and always looks good. I think the On the Rocks Top will be the same. 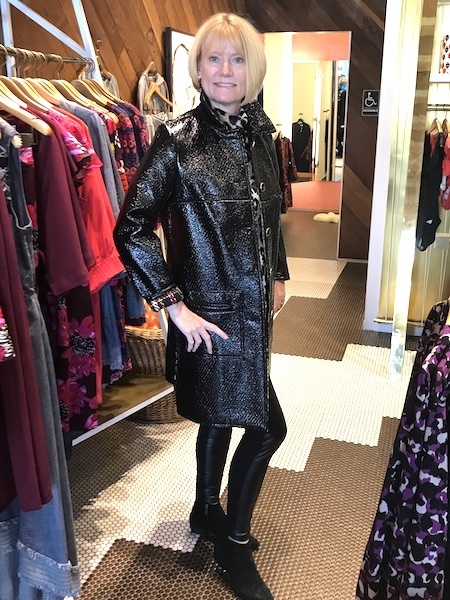 I had to try on the Jones Coat as it had caught my eye on Suzanne's preview post. And it's just as fabulous on as in the photos. It's definitely on my wish list. And finally, Kim and Suzanne in action, wearing fabulous Trina Turk coats. Thanks Kim & Suzanne for inviting me to hang out with you! It was such a fun morning! I love the pink sweater! Too bad you didn't buy it! The coat looks great on you, too! Gosh, what a fun time, Andrea!! I've always loved Trina Turk's pieces when I shop at the small boutiques!! And that pink top on you was so colorful and fun!! It was truly a great time! 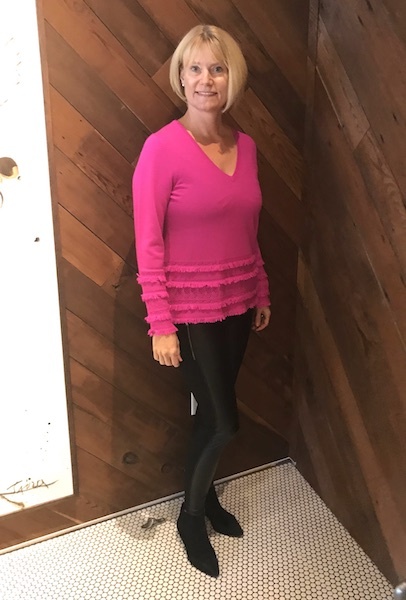 And the pink top is soooo much fun! Suzanne's outfit is simply stunning, isn't it?! 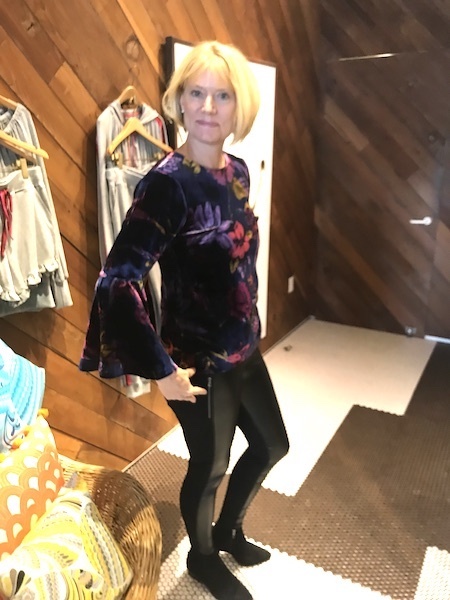 And, yes, the velvet top is great. It's still on my "list." What a fun collection! 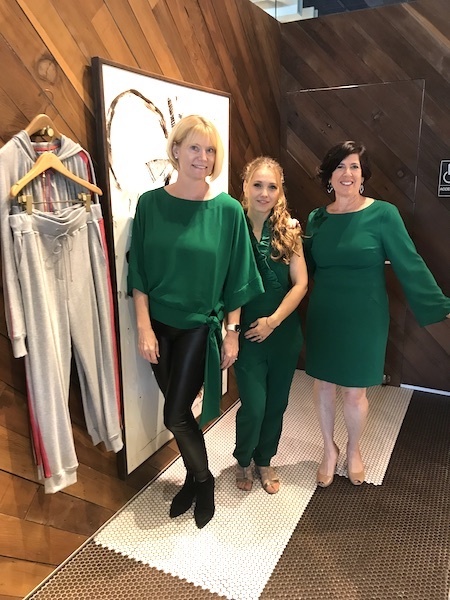 I really like all the green outfits - perfect for the holidays! Yes, the greens are awesome! And so many special occasion outfits to choose from! That sure looks like a great time. The cost is gorgeous, wow. The soda top is great but the one you bought is fabulous! It was so much fun! I love that coat! I'm definitely keeping an eye on it... I love the soda top because it SO glamorous, but I'm happy with my choice as I know it's an investment piece that I'll wear again and again for years to come. Wow Andrea! Thank you for this wonderful re-cap! The day went by so fast, I love looking back on your photos that capture it all! I am so happy you bought the black tie top. It's one of my favorite pieces! The jacket and soda top are so fun, as is that pink sweater which was stunning on you. But, I know you will be wearing the black top over and over again! It is so pretty on you and you can wear it with anything! Thanks for spending the morning with us! PS I hope I didn't comment twice, it seemed like my first comment didn't go in. Feel free to delete if I double posted! Sorry about the lost comment! What a fun day! The collection has some fabulous pieces! I love the Astral top and Jones coat! They should hire you to model their great clothes for them. Oh, my gosh!!! You look smashing. Love the pink top on you. You wear bright colors so well. The details make that top special and flirty and fun. And the leopard! Wow!!! It is spectacular with both black and white pants. You are so animated and cute in the Astral top. Beautiful. Love the sleeves. Hope you bought the store out! !